A former missionary published her autobiography to provide a wonderful testimony of God’s goodness and providence. Powerful yet personal, Joy K. Boerop’s story should inspire believers to hold on to their faith in tough times. Just this year, Joy K. Boerop celebrated her wedding anniversary with Bill, her husband of 60 years. Their marriage took them to a combined 140-countries (Joy to about 60 and Bill to about 80) where they preached the Gospel. They credit God for their relationship and attribute their marriage’s longevity to commitment to one another and to God, their love of traveling together and having a united purpose. But just like most other couples, they faced difficulties and challenges in their married life as well as struggles and pitfalls in ministry, all of which Joy opened up about in her aptly titled autobiography Joy in Living: A Memoir of an MK, an MW and an MM (Redemption Press; 2010). Readers will find her book to be more than just a wonderful, heartwarming memoir about the author’s married life, how she met Bill (in 1955 at the L’Institut Biblique Européen – the European Bible Institute – outside of Paris), and their years of struggles together. Joy in Living is, above all, Joy’s powerful testimony of a powerful God, whose providence and provision never fail Joy, even from the time she and her missionary parents were expelled from China after the Communist takeover in 1950. She endured loneliness and forsakenness in Europe, which cultures she struggled to fit in, and after finding the long-awaited answer to a burning spiritual question, she left for Paris to be trained in ministry. “It was not easy to delve into the past, remembering long-forgotten experiences in war-torn China,” shared Joy in the introduction of her book, “recounting emotions of life in Europe as a unique individual, and recalling countless miracles of God’s love in a new homeland. The challenges that delayed Joy in sharing her “Joy in Living” in the faithfulness of God through the years did help her to prepare and strengthen her personal testimony as a missionary kid (MK), missionary wife (MW), and missionary mom (MM). Readers will learn that all these were God’s ways to use her story of faith to inspire people around her – and for His glory. Be inspired by Joy K. Boerop’s story of faith. Find the calling to preach the Gospel. 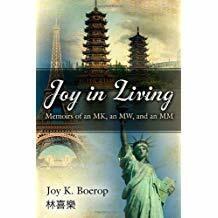 Order a copy of Joy in Living: A Memoir of an MK, an MW and an MM today through Amazon https://www.amazon.com/Joy-Living-Memoir-MK-MW/dp/1414115695 and Barnes & Noble https://www.barnesandnoble.com/w/joy-in-living-joy-k-boerop/1119890503?ean=9781632324092 . A copy of her book can also be ordered through her website www.joyinliving.webs.com and you will receive a hand autographed copy with her Chinese name. Watch out for the public display of this inspiring autobiography at the upcoming 2018 Miami Book Fair on November 11-18 at the Miami Dade College’s Wolfson Campus in Downtown Miami. Joy K. Boerop was born and raised in China, living for 18 years through WWII and the Communist takeover of her homeland. Most of those years Joy was separated from her parents. The climactic experience was her escape from Communist China. Joy in Living demonstrates clearly God’s love, whether living in China, Europe, the United States, South Africa, or traveling the world, teaching and training pastors and church leaders.